Hi there! You might think it's hard to get in the Christmas spirit when it's a hot and steamy 90 degrees outside (and worse inside as I opted to skip the AC this year as a cost saving measure! ), but KennyK Stamps has three new Christmas images being released today that will have you singing "Walking in a Winter Wonderland" in no time! 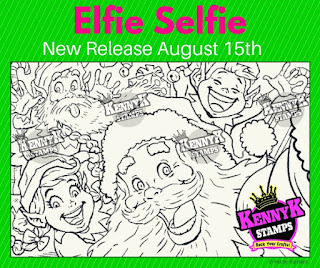 Introducing Elfie Selfie, Christmas Dance, and Santa Baby! Visit the shop HERE to drop one or all of them into your cart and check out! It's never too early to start those holiday cards! I opted to work with sassy Santa Baby for our new challenge over at our Facebook group, Club KennyK! It's one of my favorite themes of all times!!! Can you guess what that is? 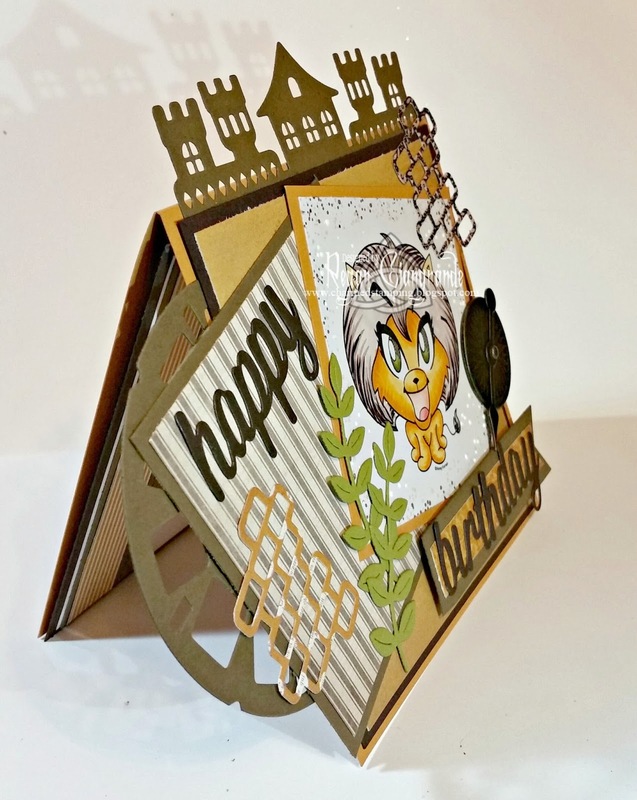 DIE CUTS, of course! Our Anything Goes challenge has an optional twist to use one or more die cuts on your project. I'm pretty sure I met the requirement... What do you think?!?! 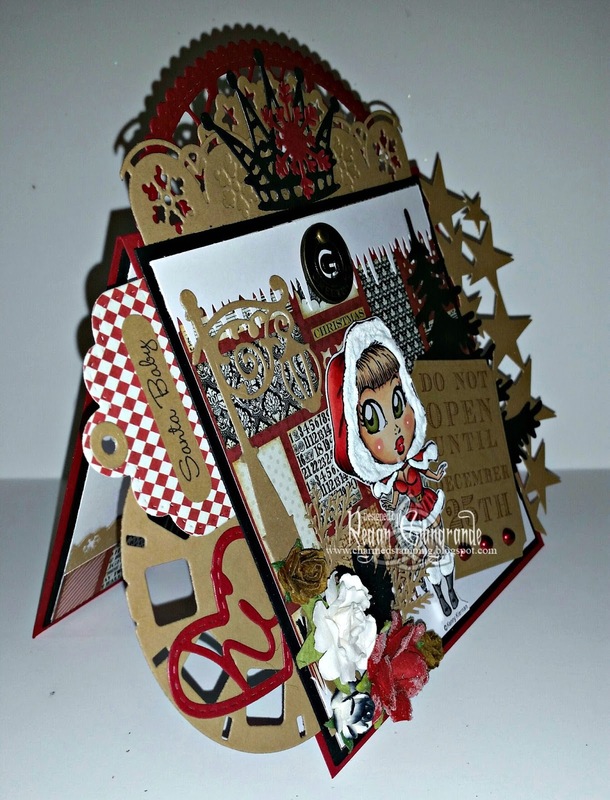 Santa Baby is colored with Copics and fussy cut. I then added Snow Writer texture to all the "fur trim" parts of her outfit. She's popped up on foam squares for dimension. And yes, I used a few dies on my creation! The snowflake and branches are Martha Stewart punches. The big sentiment is from Studio G (Hampton Art) and the small one on the tag is from My Favorite Things. 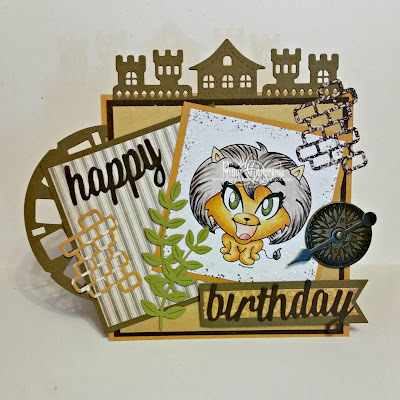 I used a Stampin' Up punch to cut that one out. Flowers, pearls, and the metal Tim Holtz Word Token are from my stash. Come visit us at Club KennyK to see the Krew's Christmas cheer! And play along with the challenge for your chance to win! Winner gets 3 digis of choice (5 if the optional twist is used!) and each of our Top 3 picks receive one digi of their choice each! Hi there! Summer is just chugging along here and before we know it the kids will be back in school and then crisp Fall air will turn our thoughts to apples and pumpkins and falling leaves... But not quite yet. In the meantime, we still have some warm days ahead (right now we are in an uncomfortably hot, humid streak)! We did a beach weekend last week and it was perfect, though! But boy did I wish I looked like this in my bathing suit! This is Beach Pretty from Saturated Canary. 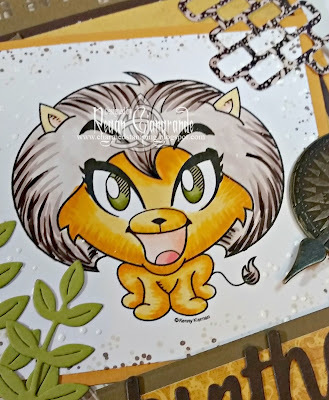 She is colored with Copics and cut using Resplendent Rectangles Nestabilities (Spellbinders). This was a custom make for a retirement. 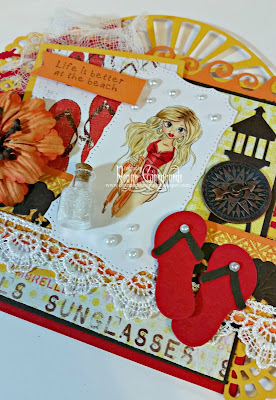 The theme was inspired by the recipient's chosen retirement location and love of flip flops. I used a few of my La-La-Land dies, of course! Featured here are Sunburst, Lighthouse, Shell Border, Wave Border, Diamond Wire, and Large Lacy Border. The flip flops are from Surf's Up Shapeabilities (Spellbinders). I embellished with a metal Compass and Game Spinner (Tim Holtz) as well as lace, cheesecloth, a flower, and pearls from my stash. The little bottle that I filled with glitter is also Tim Holtz. 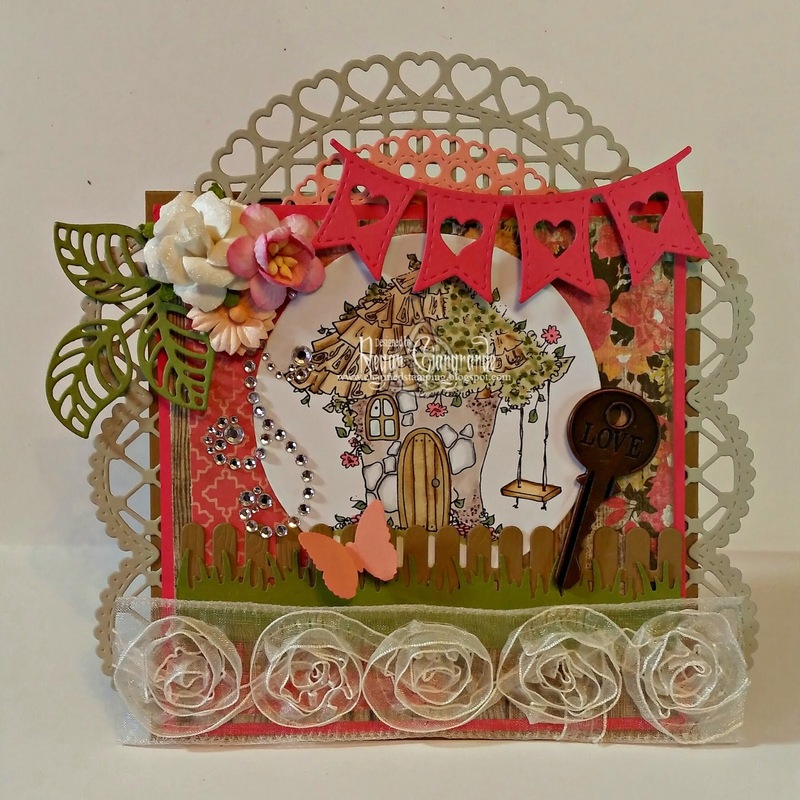 The sentiment is from LLLC's June 2015 kit, but you can get it now with Summer Fun Marci. It is cut using the Fishtail Flags Stax Die-namics from My Favorite Things. I still can't quite believe that Krista will be closing the Saturated Canary shop at the end of the month! But the good news is fans can sign up for a year's subscription to continue getting new SC digis through September 2017 (click HERE to read all about it)! I own a ridiculous amount of Krista's images, but I love them all and hope to continue using them for years to come! This one features Sweet Shack from Saturated Canary. I made it for my co-worker who recently closed on her very first house! 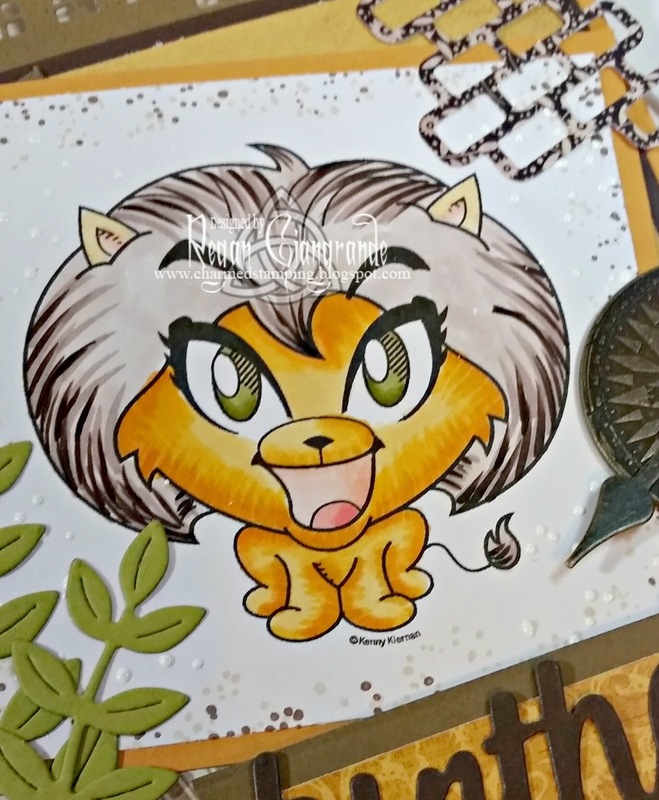 The image is colored with Copics and cut using Classic Circles Nestabilities (Spellbinders). 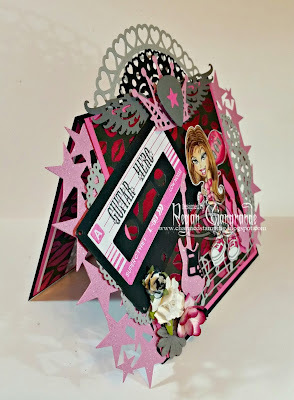 I used Open Leaf Flourish, Heart Banner, Lattice Border, Open Hearts Doily Border, and Heart Fan dies from La-La-Land Crafts. The picket fence is My Favorite Things and the butterfly and grass border are Martha Stewart punches. 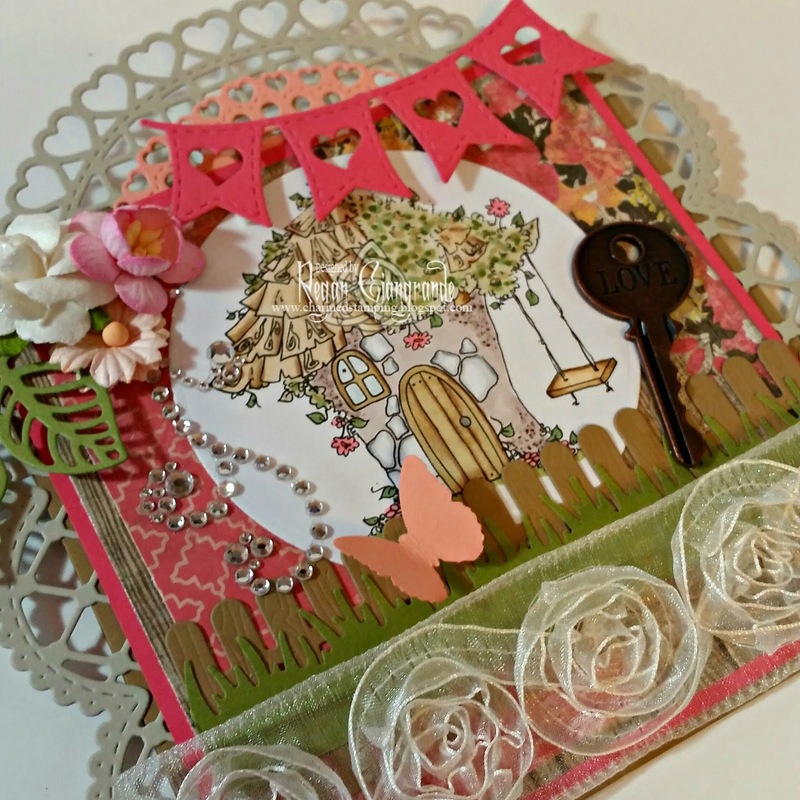 The flower ribbon, flowers, rhinestone flourish, and Tim Holtz metal Word Key are all from my stash. Thanks for stopping by and stay cool! Hello! Welcome to August! 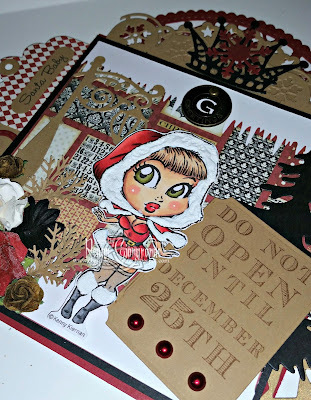 It's my birthday month so Elena from KennyK Stamps asked me to select the freebies this time around! I chose Rock Chick and Cute Lion! I think they sum me up pretty well! How do you get these free digis, you ask? Well, you can get them by signing up for the monthly KennyK Stamps newsletter AND by joining our Facebook group, Club KennyK! There is a newsletter freebie every month and either a freebie or a Dollar Deal at the Club! You can't beat it! And did I mention that there is challenge, too? Until August 14th you can enter any coloring of or creations made with these two images for a chance to win! You MUST use one of this month's freebies (Rock Chick or Cute Lion). The theme is Anything Goes. Our winner will receive 5 digis of choice while our Top 3 will get one digi each for the honor! Visit Club KennyK on Facebook and refer to the pinned post at the top for all the details! I was so excited that I made cards with both of them! Let's start with Rock Chick. She is colored with Copics, fussy cut, and popped up on foam squares. 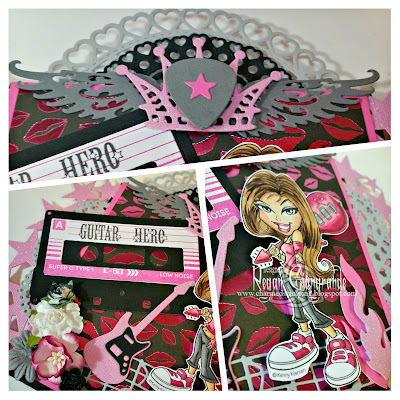 Per usual, I used a boatload of dies! I couldn't stop myself... I just kept piling them on! 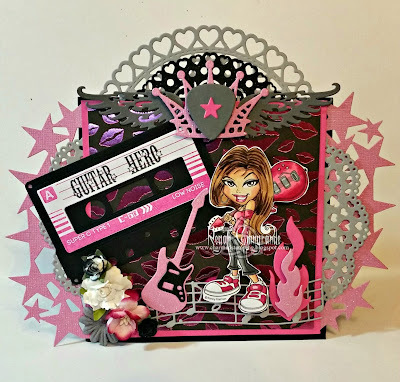 Here you fill find Wings Set, Filigree Crown, Open Hearts Doily Border, Hearts Doily Border, and Heart Fan (La-La-Land Crafts); Tim Holtz Star Cluster Border (Sizzix); Accent It Rock & Roll and Cassette Tape Die-namics (My Favorite Things); and Virtuoso Music (Memory Box). I used a coordinating My Favorite Things stamp set on the tape. It's called Journal It - Playlist. And the sentiment (which was perfect) is a $1 Michaels impulse buy find! The papers and flowers are from my stash. Next is Cute Lion. I picked him because of my Zodiac sign - I'm a Leo! I'm going to give him to my co-worker whose birthday is the day after mine. The image is colored with Copics. I then stamped Itty Bitty Backgrounds (Stampin' Up) around the edges in Tim Holtz Antique Linen Distress Ink (Ranger) and Momento's Rich Cocoa ink. I also sprinkled on some Shabby White Fran-Tage and heat set it. 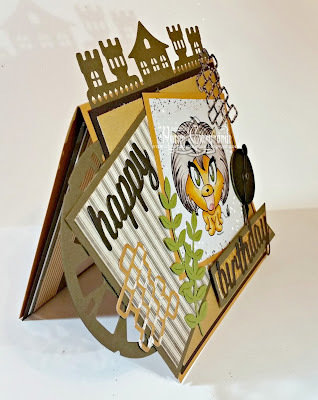 The dies I used here are Tim Holtz Picture Wheel (Sizzix); Happy Birthday and Fishtail Flags Stax Die-namics (My Favorite Things); and Castle Border, Bricks, and Jungle Vines (La-La-Land Crafts). 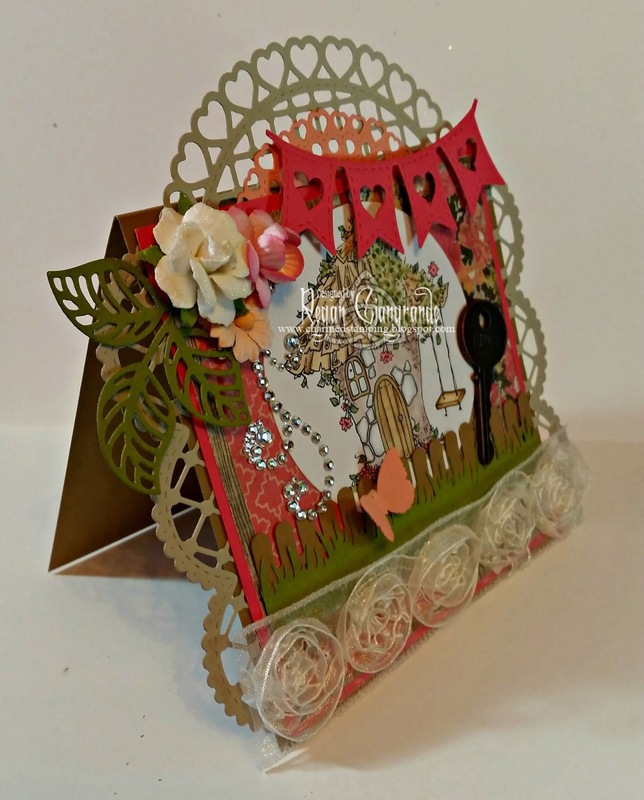 The papers are from my stash and I added a Tim Holtz metal compass coin and game spinner. I spent all day yesterday crafting on a rainy Summer Sunday and it was perfect! I had a lot of fun coloring these two! Don't forget to visit KennyK Stamps on the web and on Facebook to make sure you don't miss a single monthly freebie or deal!